the chalet, a brand new cottage from 2 to 5 places. Property 4: the chalet, a brand new cottage from 2 to 5 places. Cottage under the three peaks - Apartment "Gateway"
Property 23: Cottage under the three peaks - Apartment "Gateway"
Gîte 25 m2 duplex, on the ground floor, in an autonomous building. Property 33: Gîte 25 m2 duplex, on the ground floor, in an autonomous building. 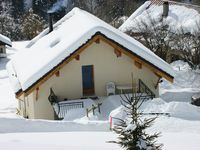 Gite 2 ears, in the mountains, ski, hiking, cyclo - 6 pers - 2 ears. Property 34: Gite 2 ears, in the mountains, ski, hiking, cyclo - 6 pers - 2 ears. Property 43: Cottage "Deer Belledonne"
Thank you for the stay! We really enjoyed to stay Le Sappey-en-Chartreuse cottage. The place was really clean and had every tool and gadget that any tourist can expect during the stay. Kids loved the loft. The place was warm and comfortable. We would like to return someday to do more exploration of this gorgeous part of France. Merci!!!! My wife and I spent two weeks in this lovely, comfortable mountain retreat. It is a studio apartment with a nicely appointed kitchen where we prepared meals each day. The views of the Chartreuse massif from the hillside just in front of the the gite's doorway are stunning (better than a picture can quite capture). The village at the bottom of the hill has excellent shops--bakeries, butcher, cheese, wine, vegetable and fruit, and grocery store. We also raided the vegetable garden each evening (at our hosts' invitation) for fresh salad ingredients. The gite is completely private, yet you also have on site wonderful hosts, Anna and Pierre, happy to help with any issue that might arise. Hiking and cycling are at the doorstep. And with a nice central location, innumerable other excursions are within an hour's drive. So many, in fact, that we'll be returning to pick up where we left off.